What Are Retinal Tears and Detachments? Retinal tears and detachments can result in blindness if not treated promptly. Therefore, if you have any of the symptoms listed below, you should contact our office immediately for an appointment. Retinal tears and detachments are considered to be ocular emergencies, and you should be evaluated by a doctor within 24 hours. The eye is like a camera. The lens at the front of your eye focuses light onto your retina, the thin nerve layer at the back of the eye that transmits images via the optic nerve to your brain. The vitreous gel is the fluid that fills our eye and is attached to the retina. This vitreous fluid helps the eye maintains its shape. When the vitreous gel changes shape as we get older, it tends to shrink and pull away from the retina. This shrinkage can cause the retina to tear or pull away from the back of the eye, usually in peripheral areas. When this happens, fluid can leak through the retina and lift it off the back of the eye. Once the retina begins to separate from the back of the eye, it usually continues until most or all of it has detached. If the retina detaches, it is no longer sensitive to light and its light receptors will no longer be able to send images via the optic nerve to the brain. This results in loss of vision. Fortunately, prompt treatment can repair tears and reattach the retina. Who Is at Risk for Retinal Tears and Detachments? Although a retinal tear or detachment can occur at any age, the risk increases as we reach middle-age or older. This is due to normal shrinkage of the vitreous gel. 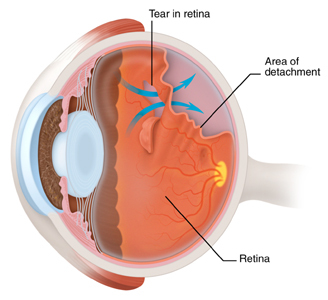 What Are the Symptoms of Retinal Tears and Detachments? While these symptoms do not always mean that you have a detached retina, you should call your doctor immediately. If you have a tear or a detached retina, prompt treatment can prevent serious damage to your vision. How Are Retinal Tears and Detachments Detected? A tear or a retinal detachment is diagnosed during a dilated eye examination. Drops will be placed in your eyes to dilate your pupil and the doctor will examine your retina using an ophthalmoscope. This examination will determine the severity of the detachment, and whether the macula, the area of the retina responsible for central vision, is involved. These examinations take place at all five of our office locations.